Arrive home and be welcomed with the fresh scent of evergreen by hanging a homemade classic fresh wreath on your front door this winter. This simple DIY wreath is totally minimalist and elegant. Using an embroidery hoop as the base, adorn your wreath with greenery and dried flowers found right in your own backyard and polish off with a velvet ribbon and mini Christmas bulbs. No more room on your tree? Instead of leaving your extra Christmas ornaments tucked away in a storage box, repurpose them into a fun wreath! This easy DIY makes for a fun crafternoon with friends and family. Add some candy cane red to your door by cutting red burlap into small circles to cover a foam wreath. Instead of the traditional circle wreath do something different this year, and hang a diamond shaped wreath on your door this holiday season. Add some extra sparkle to your holiday decor with this disco ball wreath. Why stop at one wreath? Cover your entire front door by hanging 3 wreaths tied together with a ribbon for a more dramatic look. Repurpose your leftover birthday party decor by using honeycomb balls in a variety of colors to build a fun Christmas wreath. For a quick wreath, pain a wire wreath gold and enhance it with a small plant accent for a wreath that would look amazing in your house all year long. Celebrate the falling snow with a white snow themed wreath that you can hang on your front door. Wrap a wreath with sequin ribbon to make this simple but glamorous wreath this winter that will add a bit of extra sparkle to your holiday decor. Decorating your home for the holidays does not need to be expensive. Using sheets of paper you can DIY this beautiful wreath to hang on your door. Spell the word joy over your mantel by making an evergreen J and Y to go beside a regular round Christmas wreath. Poinsettias are a classic holiday season flower, and you can incorporate them into your home's decor this winter by making this easy to DIY wreath out of artificial poinsettia blossoms that are used to cover a wreath. Help your kid countdown to Christmas morning by making a candy themed wreath that doubles as an advent calendar. For the 24 days leading up to Christmas, the child can unwrap one of the numbered multicolored candies which are filled with different small prizes such as toys, candies or stickers. Once the candy has been unwrapped for the day, all the child needs to do is to count how many the candies are left on the wreath to discover how many days there are until Christmas. Celebrate the snowy landscape by building a wreath to decorate your home inspired by snow-covered branches. Get creative and transform a hula hoop into a stunning large Christmas wreath using plant branches, twine, and some paper mache letters. Countdown the days until Christmas with a spectacular hanging wreath that has advent candles that you can light to countdown till Christmas. Add some romantic flair to your holiday decor by hanging a mistletoe wreath, to encourage people who pass by it to kiss next to it, which you can make using green and white felt. For a non-traditional wreath, head to the hardware store and pick up PVC pipes which you can cut into several small rings which can be stuck together to form a wreath. After you have hung the wreath, the wreath can be further enhanced by placing small Christmas ornaments inside the loops. Add a festive message to your holiday wreath with this printable mini sign that says merry and bright, and then hang newly enhanced ​wreath on a painted paper mache deer head for a fabulous holiday-themed focal point in your home. While circles are the traditional shape for wreaths, there is no reason you cannot make your wreath another shape. For a subtle unexpected twist to the traditional natural evergreen wreath make your wreath this year a triangle instead. The cooler days ahead means time for warmer socks to keep your feet feeling toasty. So as you go through your wardrobe to add in your warmer clothing, put aside you old winter socks that are worn out to recycle the for a DIY project instead. Using your old warm socks you can create a wreath filled with texture by using a small wooden sign, cut socks, and 2 embroidery hoops to create an inexpensive decorative wreath for your home. 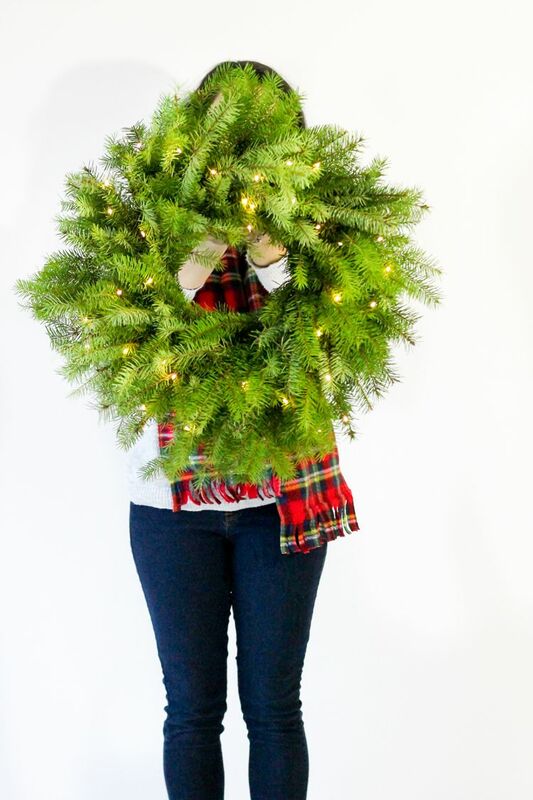 This DIY Christmas wreath perfectly illustrates how simplicity can be absolutely beautiful. Create you own lit minimalist wreath by enhancing an embroidery hoop with various types of fresh evergreen branches and battery operated lights. Put your extra peppermint candies aside from decorating your gingerbread house and use them to make a custom monogram wreath to hang on your front door. Using a pre-cut paper mache or wooden letter, you can easily cover the front with red and white candies for an outstanding wreath for your door. Update your old artificial wreath by adding a candy cane monogram that you can hang in the center of the wreath by covering a pre-cut letter which can be found in craft stores and decorate the letter with candy cane patterned paper. Craft an exquisite modern geometric gold wreath for the holidays using floral wire, coffee stir sticks and gold spray paint. This show stopping wreath is sure to be one that you will want to reuse every Christmas because it is so beautiful. Use a wire hanger and pieces of boxwood to create this classic looking boxwood wreath that will look marvellous hung within your home. Use up a some of your extra Christmas wrapping paper by rolling up pieces of the holiday gift wrapping paper to make a wreath that you can use in your house to decorate a door or your fireplace mantel. Hosting a party this holiday season, no matter what the event, from an ugly Christmas sweater party or a chic New Year's Eve party this multicolored disco ball wreath will add some festive fun to your holiday decor. The winter holidays are all about hot chocolate with marshmallows and this cute marshmallow wreath is such a lovely way to add some fun to your holiday decor. Grab a bag of large marshmallows and a wreath form and get started on creating your own marshmallow wreath, and while you are it save a few marshmallows and put them into a mug of hot cocoa to drink while you craft. Greet guests who come to your front door with this playful snowball wreath made primarily out of Styrofoam balls covered in Epson salt that is sure to make kids and adults alike smile. If you like your holiday decor to be bright and fun or prefer more traditional Christmas colors like red and green this bright red wreath would be the perfect DIY for your home. Add a romantic touch to your holiday decor by crafting a velvet mistletoe wreath to encourage two people who pass by it to kiss as is the tradition with mistletoe. Add some lovely copper wreaths in various sizes to your home, by making wreaths out of an unexpected material - refrigerator coils. Using the coils as a base of the wreath you can use the copper loops to make lit wreaths that will softly reflect the mini Christmas lights. If you are looking for a super easy and fast wreath to make to decorate your home this winter, this Christmas bow wreath is it. All you do to make it is stick Christmas bows around an embroidery hoop and your wreath is ready to hang! Figuring out somewhere to showcase all the lovely holiday cards you are given can be difficult to do, so why not make this clever DIY Christmas wreath that is made of clothespins that you can use to hold all the cards you receive this December.